Watching Captain America: Civil War brought back memories of my school days when we would choose teams for pickup football games after class. The two best players would be captains and take turns until everyone got selected. Some things apparently never change, because Civil War spends about 90 minutes setting the stage for the Captain (Chris Evans) and Iron Man (Robert Downey Jr.) to go to all their superhero buddies and more or less arbitrarily recruit them for the opposing “teams” in one spectacular showdown. Of course, before Civil War arrives at the civil war stage, directors Anthony and Joe Russo and their team of screenwriters have to come up with a reason for the Marvel universe to be in such a state of disarray. And, like the recent showdown in Batman v Superman: Dawn of Justice, to which the current film will inevitably be compared, there’s a sinister third party involved. Instead of Lex Luthor, however, it’s a very ordinary guy named Zemo (Daniel Bruhl), who is understandably upset that Marvel’s superhero team, the Avengers, trashed his fictional country and killed his family in the previous ensemble film. After Captain America and his team stop a group of terrorists from stealing a deadly virus but kill a few civilians in the process, the United Nations wants to put the Avengers under its authority, to do battle only when it sees fit. While Iron Man, who feels guilty about his involvement in some of the past destruction, is amenable, Captain America prefers to trust his own judgment. That judgment comes into question when Zemo is able to take control of the Captain’s best friend from boyhood, the Winter Soldier (Sebastian Stan), who had been brainwashed by the evil organization H.Y.D.R.A. in the last Captain America movie. Zemo orchestrates an attack on the United Nations headquarters itself, making it appear that the Winter Soldier was responsible, and government bigwig General Ross (William Hurt), who had never been a fan of superheroes to begin with, orders the Avengers to bring in the Soldier. The battle lines are therefore drawn, as Captain America refuses to give up his friend, and both he and Iron Man try to recruit others to their cause. Civil War manages to cram a dozen different heroes into its narrative, including a couple who have never been seen by filmgoers before. Spider-Man (Tom Holland), of course, is quite familiar, but the new version of the web spinner is an actual teenager who is beyond excited to be involved in the action, even as he tangles with some of his former idols. Another newcomer, Black Panther (Chadwick Boseman), isn’t nearly as excited. His father was the ruler of an African country and was one of the victims in the United Nations bombing, and he is out for revenge against the Winter Soldier. Civil War acknowledges the massive amounts of carnage and collateral damage that previous superhero battles have caused (primarily to please movie audiences for whom more-or-less routine heroics are increasingly passé). Early in the movie, the script takes a fairly ham handed approach to the subject that slows down the pace and makes some parts of the film rather boring. Further, it’s hard to seriously consider the arguments over the morality of superheroes destroying cities to save the world (while conveniently ignoring that the villains, left to their own devices, would do far worse things). Robert Downey’s Iron Man in particular is overly gloomy in far too many scenes. 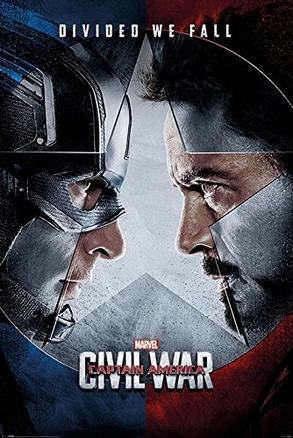 From a dramatic standpoint, Civil War does pick up in its last set piece, a much smaller showdown among only three of the heroes, at which point the movie unveils a plot twist that gives the showdown some credibility in the Marvel comic universe. This twist is far better than the rather tortured machinations that the film goes through in its early stages and makes the smaller scale final showdown more intense than the gigantic multi-hero brawl earlier in the film. Ironically, the other character who gives the film a degree of credibility is Zemo, who is probably the most unlikely of villains in a movie of this epic a scale. Unlike previous Marvel films that have been forced to unleash ever more powerful bad guys to keep audiences invested in the final outcome, Zemo is a completely ordinary Iago type, playing on his opponents’ emotions expertly. He has no powers whatsoever other than a shrewd and calculating mind. He’s the type who would be perfectly at home in a Jason Bourne movie, but seeing him maneuver the various characters into fighting each other makes him more interesting to follow than most. Still, what’s going to sell Captain America: Civil War is the action. The big battle is by far the best ever seen in a superhero film, and the directors shrewdly break it down into a series of mini-battles pitting only two or three of the heroes against each other at any one time. They also concoct scenarios that allow the less powerful characters, like Jeremy Renner’s Hawkeye or Scarlett Johannson’s Black Widow, to credibly take on the others. And, everyone seems to come armed with a sense of humor. Taking their cues from Holland’s playfully irreverent Spider-Man, the quips fly as fast as the fists do. Civil War has several other action set pieces as well, beginning with a battle between some of the Avengers and the terrorists in the movie’s opening scenes. These scenes are more effective than the usual in this type of movie, because the Russos are more intent on showing the fight rather than coming up with bizarre editing schemes to dazzle viewers. The effects work is more limited and more realistic as well. The Captain and his sidekick the Falcon (Anthony Mackie) are just two men with some high tech weaponry using it to do battle with some bad guys and not world-smashing behemoths. It’s certainly possible to make a really in-depth drama exploring the morality and ethics of being a superhero. Although it pays lip service to the notion at times, Captain America: Civil War isn’t that movie. Instead, it’s a movie that, for the most part, is a lot of fun, in the same way that watching a professional wrestling match can be a lot of fun. It’s very well made and quite funny in spots (a scene in which Downey flirts with Marisa Tomei, playing Spider-Man’s Aunt May, is terrific), with some of the best action ever in superhero films. It’s still quite early in the summer, but Civil War is well poised, and deservedly so, to win the box office wars.